The LG V30S ThinQ was announced at Mobile World Congress in February, and is essentially a V30 with extra software features and more storage/RAM. 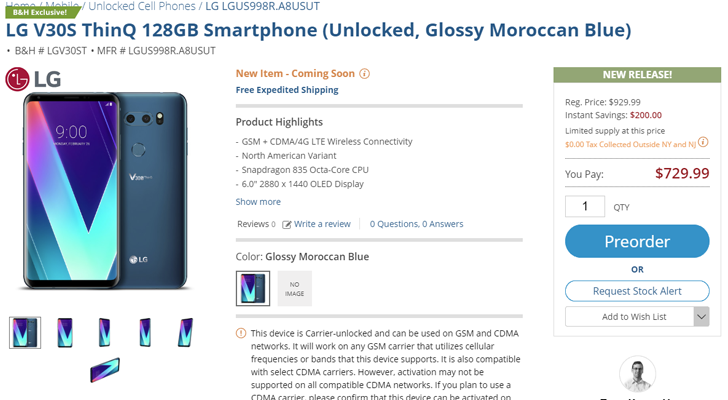 Pre-orders for the phone went live in the United States a few days ago, at a price tag of $929.99. That's a lot of money for any phone, let alone one using a chipset from last year. It seems like no one wanted to buy one, because B&H has now lowered the price to $729.99, a reduction of $200. The model on sale has a Snapdragon 835, a 6" 1440p OLED screen, 128GB of storage, 6GB of RAM, and Android 8.0 Oreo. You can buy it from B&H at the link below.